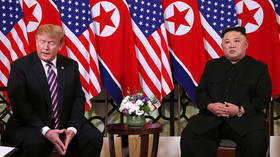 The White House has said that no deal was reached during the summit between Donald Trump and Kim Jong-un in Hanoi. Their meeting was cut short, with both leaders leaving early without holding a signing ceremony. Trump and Kim were seen leaving the Metropole hotel separately, almost two hours before they were expected to conclude their meeting and hold a signing ceremony. Speculation over what transpired was quickly put to rest after the White House stated that no deal had been reached. The Hanoi, Vietnam gathering marked the second meeting between the two leaders. While Washington has previously pushed for North Korea’s complete denuclearization, some media outlets speculated that Trump would temper his demands in the latest summit.